Installing a patio cover is the perfect way to help you seek relief from the blazing sun while enjoying your beautiful backyard space in the Albuquerque, New Mexico area. If you’re interested in creating a shady outdoor retreat, turn to ABC Seamless of Albuquerque for reliable patio enclosure installation services. Durability – The covers installed are constructed from 4-inch thick insulated foam covered with laminated aluminum which is sturdier than wood and also keeps out the sun’s heat better than non-insulated covers. Low maintenance requirements – Our covers feature baked-on enamel and are available in embossed cedar or stucco finishes that allow them to hold paint nearly three times as long as real wood. Aesthetic appeal – Our patio cover products come in a wide variety of styles so you can create the look that will best suit your home’s architecture and aesthetic design. Additionally, our patio enclosures can be converted to a room enclosure by adding walls and windows, leaving you with aesthetically pleasing options if your needs should change down the line. 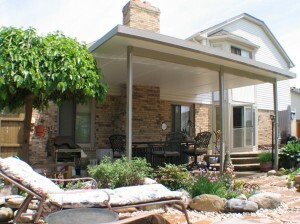 To learn more about the exceptional patio cover products offered by ABC Seamless of Albuquerque to homeowners in Albuquerque, NM, or another nearby area, contact us today. Make sure to ask about our convenient financing options available to those who qualify.